Students undertaking placements with the Going Rural Health (GRH) program, of the Department of Rural Health, are making a significant impact in small rural communities. 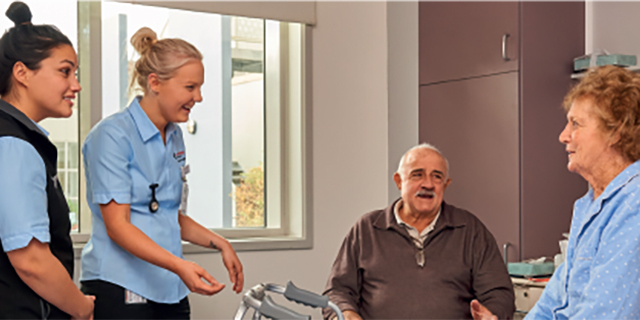 Funded through the Commonwealth Rural Health Multidisciplinary Training program, Going Rural Health develops, supports and facilitates clinical placements across regional Victoria. A key innovation of the program has been the development of Service Learning Placements targeted to meet the needs of local communities. These placements are supported by the appointment of a team of experienced clinical specialist supervisors and educators, who work directly with the students and the local health service. Typically, small rural health services struggle with workforce retention, high turnover and a shortage of nursing and allied health professionals. The Going Rural Health team worked with MDHS staff to develop Service Learning Placements for physiotherapy students. Students implemented systems to reduce the waiting list from three years to less than six months, for some services, and developed and implemented appropriate interventions with pronounced benefits to clients. Placements in rural health areas offers students a rich learning opportunity, with exposure to a wide range of experiences and the chance to work with dedicated and skilled supervising staff. Ongoing evaluation of rural placements has identified approximately 50% of students who complete a rural placement come back to practice rurally once qualified.